Sandhya’s primary areas of research are Public Finance, Public Economics, and Applied Economic Analysis and she also has keen interest in Development and Environmental Economics. Her current research focuses on Study of Public Finance of Indian States, where she studied the relative tax performance of Indian states. She has also worked on estimating the implication of federal transfers on fiscal equalization using tools of spatial econometrics. She holds an M. Phil. Degree in development studies and is pursuing Ph.D. at the Indira Gandhi Institute of Development Research (IGIDR), Mumbai. December 2015–Present Associate Fellow, NCAER. 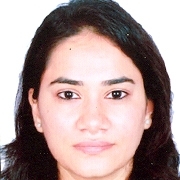 August–December 2015 Research Assistant for Dr. Ashima Goyal, Professor, IGIDR. August 2012– July 2015 Research Assistant (Environment Studies) for Dr. Sudhakar Yedla, Professor, IGIDR. July 2010 – December 2011 Assistant Manager, Dept. of Risk Analytics, Tata Consultancy Services E-Serve Ltd., Mumbai. July 2009 – December 2009 Teaching Assistant (Macroeconomics) for Dr. Rajendra Vaidya, Professor, IGIDR.